With Election Day just weeks away, the oil and gas industry has gone all in on its campaign to defeat Measure G—the citizen ballot measure to ban fracking and expanded oil drilling in San Luis Obispo County—dumping $4.7 million into its coffers and spending more than $1.6 million on the effort since July 1. EXPENSIVE FIGHT Four oil companies, including Sentinel Peak Resources, have contributed a combined $5.4 million to fight Measure G in SLO County. The recent infusion of cash came courtesy of a $4 million contribution from Chevron Corporation on July 11 and a $675,000 donation from Aera Energy, a subsidiary of ExxonMobil, on Sept. 24, according to Sept. 22 campaign finance filings. The two oil firms join California Resources Corporation and Sentinel Peak Resources, the Arroyo Grande oil field operator, in the fundraising battle. Between the four, their contributions to the opposition total $5.4 million. Chevron has some active oil wells in SLO County in the Midway Sunset oil field at the Kern County border, as well as several land holdings throughout the county. "We exercise our fundamental right and responsibility to advocate positions on policies that can affect the company's ability to explore for and produce energy. We do so consistent with U.S. laws and Chevron policies," Chevron spokesman Sean Comey told New Times in an email. The No on Measure G committee had spent $2.2 million of its dollars as of the Sept. 22 filing. One chief beneficiary is SLO County 1st District Supervisor John Peschong and his consulting company, Meridian Pacific Inc. The Sacramento-based firm with an office in Templeton has received up to $329,000 in payments thus far for Measure G campaign services. Other major recipients of funding include Santa Monica-based Winner and Mandabach Campaigns and Sacramento-based law firm Nielsen Merksamer Parrinello Gross & Leoni LLC. The war chest against Measure G far exceeds that of its proponents. The Yes on Measure G campaign raised $78,630 from 156 donors between July 1 and Sept. 22, while it spent $75,297. In all, the measure has received more "non-monetary" support ($92,854) than it has cash donations ($91,100)—including in-kind legal services from the Center for Biological Diversity, whose staff is backing the measure. "Our fundraising has really picked up," said Charles Varni, co-chair for the Yes on G campaign. "We have been, from the beginning, a grassroots organization, and ultimately that's how we're going to win this. ... We're facing a multi-million dollar propaganda campaign by Big Oil." Among local politicians and political groups, the battle lines over Measure G are drawn. Progressive leaders like SLO Mayor Heidi Harmon and Assembly candidate Bill Ostrander, and groups like the SLO Democratic Party and Sierra Club have endorsed the measure. Conservatives like County Assessor Tom Bordonaro Jr. and 5th District Supervisor Debbie Arnold, as well as the Republican Party and the Coalition of Labor, Agriculture, and Business (COLAB) of SLO County are in opposition. As the Nov. 6 election grows near, campaign rhetoric on Measure G abounds. Mailers for the "No" campaign are hitting doors, claiming that the measure "simply goes too far." Opponents warn that it would result in an oil industry shutdown—more than 200 lost jobs, millions of dollars lost in economic activity, and $2 million lost in tax revenue. "Measure G is poorly written and deceptive," said Matt Cunningham, spokesman for the No on G campaign. "Its practical effect would be to prohibit well maintenance needed for ongoing oil and gas operations, thus resulting in shutdown." 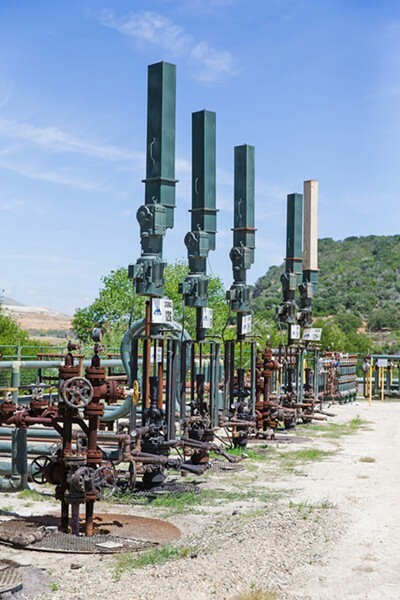 An official SLO County economic impact statement assesses that Measure G does allow existing oil operations to continue, "as long as they are not expanded or intensified." It states that as production from existing wells declines, the $2.3 million in 2017-18 tax revenue from the industry and between 32 and 76 local oil-related jobs may be affected. Varni called claims of a total oil shutdown "lies," and added that Measure G allows for routine maintenance of active oil wells. He said the measure is "all about prevention" for fracking and expanded oil production that could impact groundwater resources. "Measure G is strong in the county," he said. "Whether it's strong enough to weather this massive onslaught of media and advertising and propaganda, we'll see."